Next we'll introduce you to Kati. 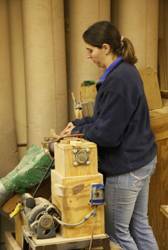 She has been working here for the last 5 years seasonally and has learned a lot about woodworking. She enjoys making spatulas, spoons and marionettes on the side. Welcome to Vermont Folk Rocker. 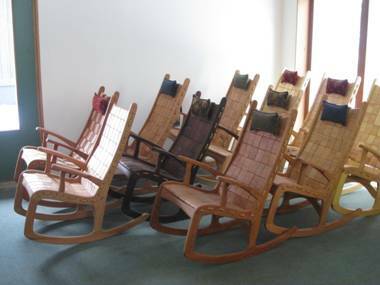 This is the rocker that I first designed in 1974. 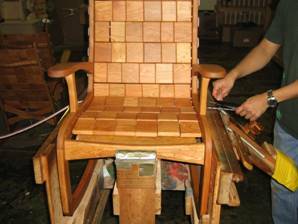 I've made hundreds of pieces of furniture, with the best of everything put into this rocker. Can I show you around my shop? I'll introduce you to the crew as we go. 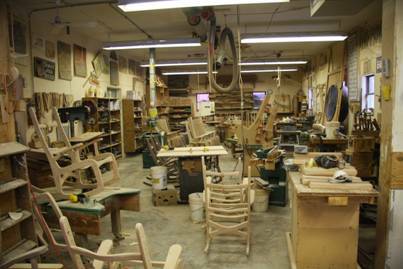 This is the shop as you walk through the front door. 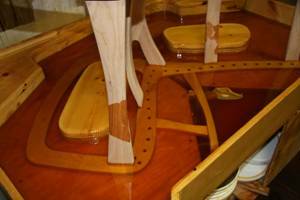 You can see some of our jigs, patterns, storage shelves and work tables. 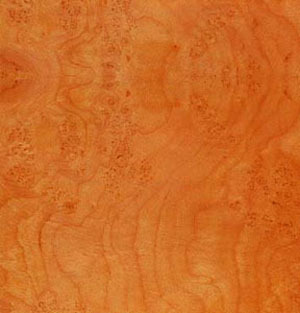 It all starts with the wood. 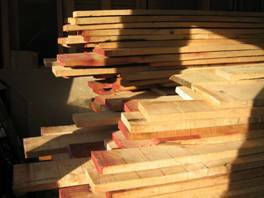 We mill our lumber down from rough boards bought from local suppliers. 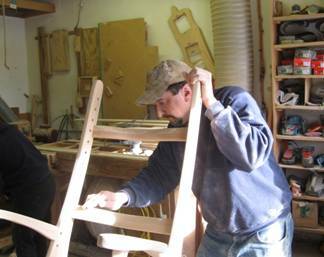 From this wood we make it all; blocks, braces, frames, rockers. This is Darrick Jagbandhansingh. 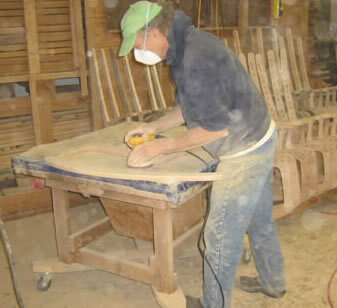 He's a master craftsman here at Vermont Folk Rocker. He's worked here for close to eight years. 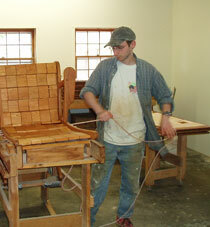 Here he's setting the rope holes to the side of a rocker. Darrick loves Hawaii and flying lessons. This is Alice Chandler. 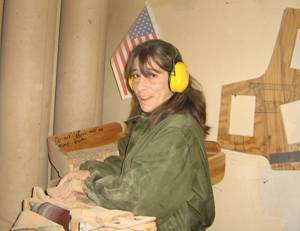 Alice is an expert sander and finish inspector. 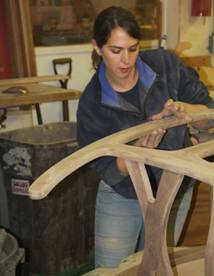 She is sanding a bird's eye frame with 150 grit sandpaper and preparing it for hand sanding. Alice has been here for six years. dancing. Alice keeps everyone laughing throughout the day. 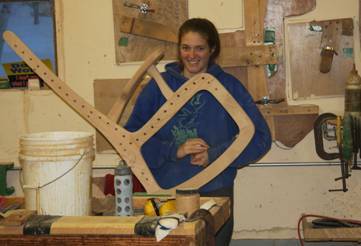 Alice is gluing up the side of a rocker, using a handmade jig to get good compression on the front joint. 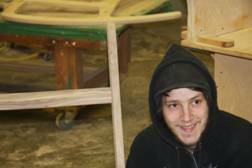 Kevin Blakeslee strings a rocker. made his own electric violin. He is currently learning airplane mechanics in Texas. Oh hey Mona! 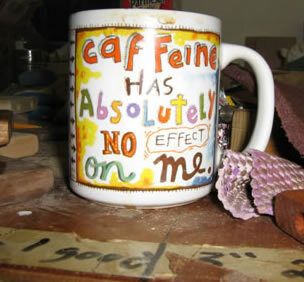 Mona is our manager in the shop. 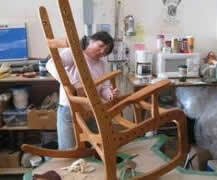 She keeps everyone working and is in charge of overseeing the chair production. 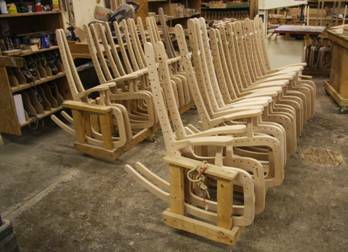 We make batches of 50 chairs at a time, so that can be a challenging task. Mona is "testing" one of our rockers, you know, just to make sure everything feels right. 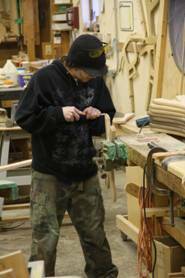 Shea is our master mortise maker. He is preparing our cross piece braces for assembly. Shea lives in Starksboro, really loves music and is very interested in the CIA and dark matter. 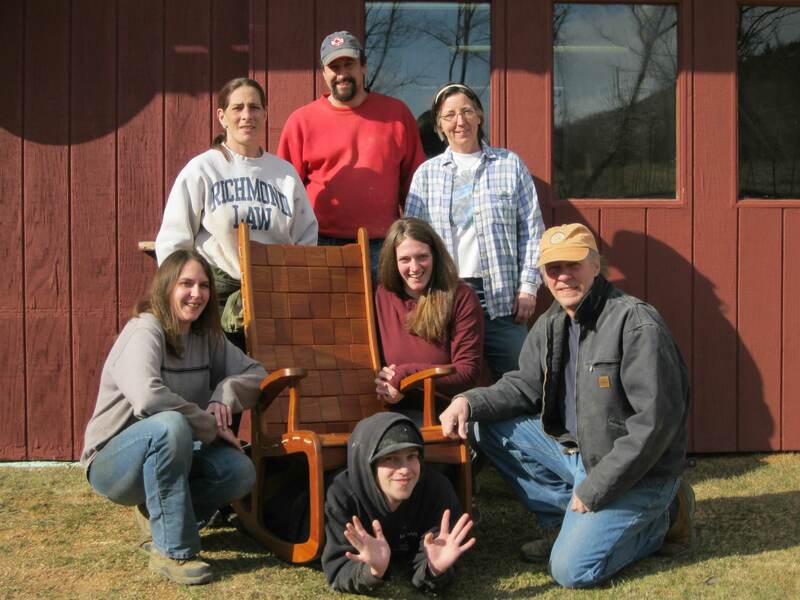 Christine started working at Vermont Folk Rocker in December 09 and has quickly become part of the team. She lives in Bristol with her husband and two kids. These are sides awaiting assembly, and our home-made racks keep them organized. Jim with his favorite hat! Hi, Carlie! She likes to visit with her mom in the shop. Carlie's mother, Kerry makes all of our neck pillows. 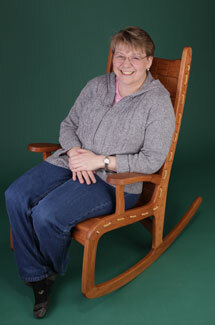 Here she tries out a child's rocker that's just her size. 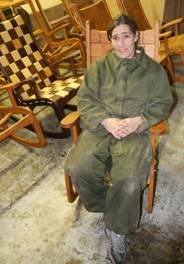 Pat has been a woodworker for over 10 years, first making cabinets and now rocking chairs. 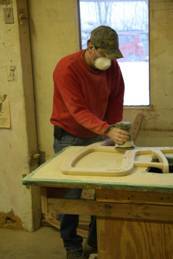 Pat does a lot of our table saw cutting and joint preparation. 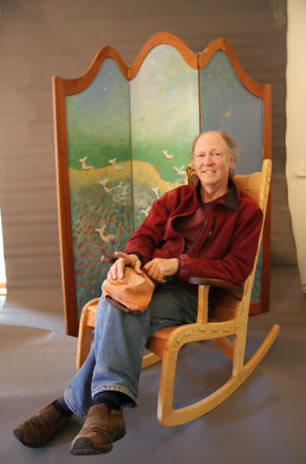 Pat owns a 160 acre farm in New Haven, VT where he lives with his new wife, Jane. They enjoy four wheeling, hunting and car shows. 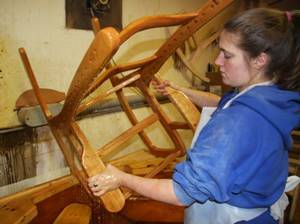 Kati doing the first round of oiling after the frames have been assembled and finish sanded. Deb Blakeslee buffs a frame after the oil dipping. The next stage is stringing, when the blocks are strung into the frame. Deb is a mother of two grown boys, Kevin being one of them. 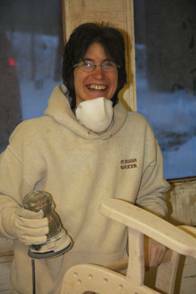 She loves arts and crafts, gardening, maple sugaring, and working with the elderly. Stringing is where it all comes together. 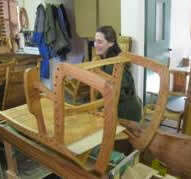 The blocks are threaded through the frame using a long needle. 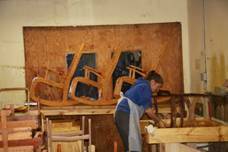 See our finished chairs, waiting for you in the showroom. 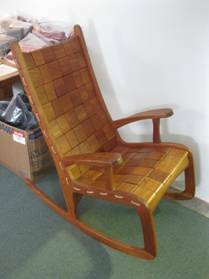 This chair is waiting to be shipped. 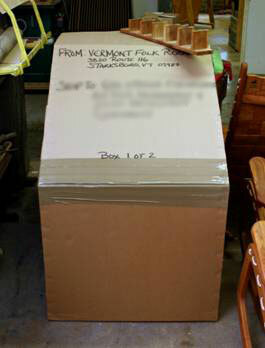 Each crate is made in the shop with several layers of packing material inside, along with the care kit and neck pillow. Melanie Côté began working in November of 2005 and likes to rock to Oldies in the office while running circles around Jim. Mel resides in Starksboro with her sons, Joseph and Jacques. She is another one of the friendly voices you will hear when you give us a call!